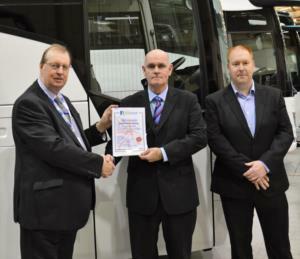 Golden Boy Coaches have become the latest quality operator to join the prestigious Guild of British Coach Operators. Guild Chairman Andrew Richmond said: “We are delighted to welcome another successful and respected operator into the Guild, particularly as they celebrate 50 years in business. I’m sure Golden Boy will have a lot to contribute to our discussions as we continue to share best practice and showcase excellence in coach travel”. Terry McIntyre, Joint Managing Director of Golden Boy, said: “Being a member of the Guild complements our commitment to providing the highest standards for our clients and colleagues. We are looking forward to working with other Guild members and sharing knowledge and ideas with the best in the coach industry”. Based at Hoddesdon in Hertfordshire, Golden Boy Coaches first took to the road in 1968 and is still owned and managed by the same family. Over the decades the company has grown in size and has earned an enviable reputation for providing high quality coach hire and an has an excellent reputation for customer service. The distinctive “Golden Boy” livery and the tradition of personalising each coach by naming them “Master ---“, has gained a loyal fan club who like to spot the coaches. The fleet of 36 coaches has an average age of just three years old. The company’s maintenance facilities are also one of the few to hold the CPT Workshop Accreditation. Now in its 33rd year, the Guild promotes and markets the services of its members, all of whom commit to meeting the highest quality standards, assured by regular independent audits. Prospective members have to achieve a 100% pass before being accepted into the Guild. The Guild is also registered as a Driver CPC training centre, giving members access to a suite of courses specifically designed for the coach industry.